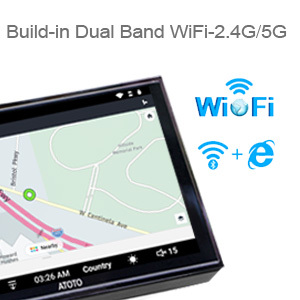 ATOTO A6 Pro has all the features available previously on A6 Premium (vehicle pecific FM/AM Radio tuner with RDS, builtin GPS Navigation module, AUX Audio/video input,Backup camera/dash camera input/TPMS/4G dongle/Dab+ input, Dual Bluetooth for handsfree & data transfer, steering wheel audio control,Quick Booting, max 2A quick charge), and some extra & exclusive features; *This model fits selected Volkswagen/Skoda vehicles, and original steering wheel audio control will be retained. *Dual Bluetooth (BT)chips inside not only work as BT handsfree /media streaming, but also connect to phone's BT tethering to access internet, send/receive files, and even connect to BT gamepad /mouse &OBD. Built in GPS module, pre-installed map engine app: Google Maps(free),users need to download map data of certain area from the app setting for offline navigation. Waze/HERE WeGo/Tomtom are also supported. 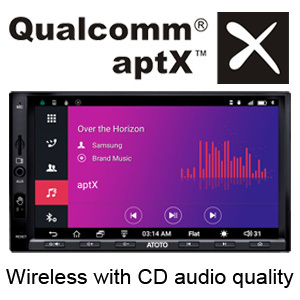 Check approval of ATOTO aptX feature by visiting Qualcomm aptX official website: aptx.com/products/atoto-car-entertainment-system. Latest ATOTO AICE OS 9.4.3 system firmware is now available. New firmware update in future can be found on ATOTO Online Customer Service Support System(AOCSS, support.myatoto.com). SoC Chip: MTK 8127A Soc-based Quad-core 1.5Ghz CPU with ARM Mali-450 MP4 GPU; System Version: ATOTO AICE OS 9.4.3, which is developed & customized based on Android 6.0 Marshmallow OS; System Language: English, German, French, Italian, Spanish,Portuguese, Arabic, Russian, Japanese. One Micro SD slot - to store media files,dash DVR records; 3 USB interfaces - Read USB Drive, and optional USB devices. Both USB interfaces and Micro SD slot can read unlimited external storage devices, including SSD Hard-drive, as long as it can be powered on with USB 500mA interface! Applicable to Volkswagen models that OEM factory radios are of RCD 210/RCD 310/ RNS 310/ RNS 315/ RCD 510/ RNS 510. Some VW vehicles from North America that have been confirmed in installation: Beetle 12-17/CC 09-17/EOS 07-16/Golf 10-16/GTI 06-14/Jetta (with new dash) 2005/Jetta 2006+/Passat 06-up/R32 07-08/Rabbit 07-09/Tiguan 09+. The same VW model may be called differently in name and manufacturing year for different market, but as long as they looks the same in facotry radio shape, this model will fit.